After Star Trek the series was cancelled and before Star Trek: The Motion Picture put him back in the captain's chair, William Shatner spent a season as Jeff Cable, an undercover government agent patrolling the wild streets of 1880s San Francisco. Filled with casinos and saloons, the post-Gold Rush city runs on corruption, greed, and violence. Cable teams up with Cash Conover (Doug McClure, The Virginian) to crack down on criminals. This playful take on traditional Westerns was an Emmy® nominee. 13 episodes, 12 3/4 hrs, 4 DVDs, SDH. 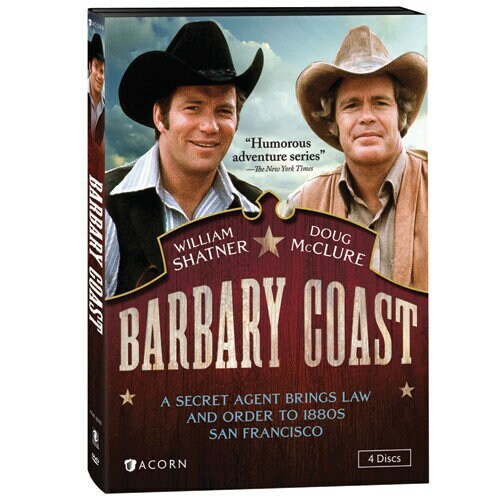 Undercover agent Jeff Cable enlists the help of casino owner Cash Conover to thwart the Crusaders, a violent, mob-like ring of extortionists looking to exploit the Barbary Coast's lawlessness and steal from the area's wealthiest men. Cable conducts a sting operation to nab one of the area's largest counterfeiters. But the local police interfere and mistake him for a common crook. With the investigation in peril, Cable must track down hundreds of thousands of dollars in fake currency. Two priceless jade figurine cats on loan from the Chinese government are stolen, threatening United States foreign relations. Cable recovers one of the cats, but to find the other, he must enter the culprit's den. A friend of Conover's, on the run after stealing a horse, seeks shelter in the casino. But he arrives with an enticing secret: the $20,000 he owes in gambling debt is buried under Redwing Jail. Conover and Cable must find a way to get it without the town's sheriff catching on. After the infamous Jesse James robs a bank in a nearby California town, Cable has his heart set on catching the outlaw. When clues start pointing to the Barbary Coast as James's next target, Cable and Conover hatch a plan to get in on the job. A ship carrying U.S. Army supplies sinks off the coast of Monterey. It could have simply been a tragic accident-if all 3,200 rifles on board weren't missing from the wreckage. Cable poses as a potential buyer to find the culprit. Cable learns that members of the Irish Society are gathering at a local pub. Posed as a waiter, he overhears a conspiracy to assassinate Charles Stewart Parnell, the society's leader. Unaware of their motives, Cable must find a way to stop their imminent plan. Secret plans for a state-of-the-art, iron-clad submarine are stolen from the navy, and Cable is tasked with getting them back. The documents could've been taken by any number of rival countries, so Cable goes undercover as the eccentric attache to the Archduke of "Servia" and poses as a potential buyer. Cable has his sights set on taking down one of the most corrupt overlords in town, Austin Benedict. Because Benedict is notoriously superstitious, Conover and Cable concoct a plan to infiltrate his home by holding a fake seance. An anonymous serial arsonist called the Shark is on the loose, threatening to torch anyone who doesn't pay his representative for protection. To stop his racket, Cable and Conover must first narrow down the large pool of suspects. Two sets of criminals-a pair of con men and a group of extortionists-are ripping off the citizens of the Barbary Coast. Conover invests in a fake diamond mine, with Cable posing as his geologist, to play the conspirators off each other. Cable and Conover apprehend who they believe to be John Wilkes Booth on the run in Canada. They turn him over to the authorities, but the man, facing execution, claims he's been framed. As more convoluted details of the defendant's life emerge, the two men aren't sure what to think. Mary Ellen, a young woman claiming to be the daughter of one of Conover's old friends, arrives at the Golden Gate Casino looking for a job. Smitten, Conover sets her up with a table, but his romantic notions blind him to what's really going on. When the children of four deceased Confederate agents convene in a nearby hotel to hunt down the gold fortune their parents stole and hid many years ago, Cable has the chance to claim the reward for himself and defend his father's honor.